When I load an organ, only the Brasov surround is listed. When I try to load an organ with the adjust memory option, there does not seem to be a simple stereo option available. It seems like I only have an option to load the full surround set. I am unable to load a 'small' version of the organ. I will gladly help you further. Loading as many ranks as desired, it is only and exclusively in the hands of the user. There is no "option" to load a stereo set to be expected. You can simply say which ranks to load and which not. And by doing that, you free your RAM whenever necessary. (The only reason not to load the sample set in surround is lack of available RAM). In the left, you have all the ranks listed! So, it is no problem to select some of them and mute them completely, to save some RAM. As you can see, there are three "kinds" of ranks. First, there are ranks named as Front (Diffuse), then those Front (Direct) and those Rear. So, that is all you need. Now, you can, for example, mute all the ranks marked by the word rear. Simply select all of them at the same time (by clicking them with shift-key kept), or select one at time, as you prefer, and then, in the right side of the window, look at the top! There, you can see a question: Rank enabled? So, simply answer No! to this question, for each rear rank. By doing this, you are muting all the rear ranks. 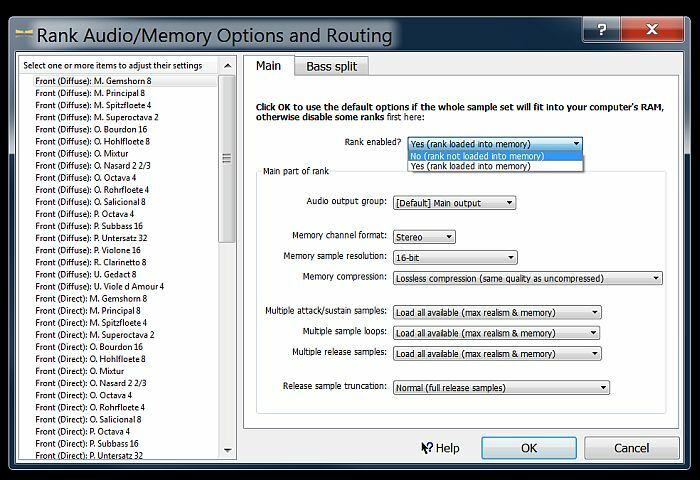 Then, if it is still not enough to make the sample set to fit into your RAM, you can proceed further by muting also all the Front direct ranks (to have the sample set in simple diffuse stereo). Of, if you prefer more direct sound, you can leave the front direct ranks enabled, and you can mute the front diffuse ranks instead, it all depends exclusively on your personal preferences. So, this is the procedure.